Improvements to Whitehall Recreation Ground began on Friday (May 5) after securing funds to restore the cordoned-off bandstand and give the park a facelift. A topographical survey began on the site, also known as the Rugby Recreation Ground, and restoration work on the bandstand is scheduled to begin later in the year. Further improvements will be undertaken once more money is secured but residents and community groups are being consulted on what should be done. 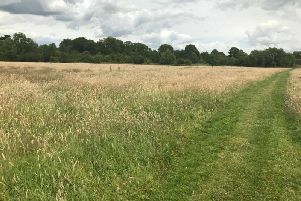 Rugby Borough Council head of environment and public realm Sean Lawson said: “Whitehall Recreation Ground is Rugby’s oldest public green space and has played a major role in the history of the town for more than 140 years. Hopes to restore the park in late 2012 were dashed after an unsuccessful bid for lottery funding but now alternative funding has been identified allowing a phased programme of improvements. The first phase, funded by Section 106 payments already allocated, will see the bandstand made safe and restored to allow it to come back into use, as well as a new play area and skate park. The bandstand was closed off following health and safety concerns about its condition, leading to calls for the council to restore it, including a petition signed by 548 people. Later phases will bring improvements to the pathways and planting, making the war memorial more accessible, tree planting, an outdoor gym and public art. These later improvements will be scheduled as grant funding is identified. Previous work overseen by the council has resulted in community-led improvements at Hollowell Way in Brownsover, at Gladstone Green pocket park in New Bilton, and the Green Flag-winning Centenary Park in Newbold. Residents and community groups are being asked to give the council feedback so that their suggestions can be incorporated in the final plans. To find out more about the park and consultation, visit www.rugby.gov.uk/whitehallrec or by looking out for consultation materials at venues around the town.